Description 12 of 164 (8 x 10.7cm) glass plate negatives. Digital images of this negative have been made, put on a compact disk (see 2007.068.0004) and displayed here. According to catalogue record 1997.048.0023 this photograph shows, Maggie with baby Jack and her husband Lew Couper sitting on the fence. The person standing by the sheep yard fence was unknown. The caption for the negative written in 2007 says, "Lew Couper in sheep yard, Maggie Couper and baby Jack, possibly Will Couper", but when seeing the clearer image here, Lesley Gardiner is adamant this is not her grandfather, Will Couper. The 2007 caption continues, "Standing in front of Lew Couper's 1916 house, Pelorus. From 2000-2007 this house lived in by Ruth O'Sullivan, a Couper descendant." Maggie [died 1940] is nee Kelliher wife of Lew Couper [1882-1945], the baby is John Alexander (Jack) born 1916, their eldest child. 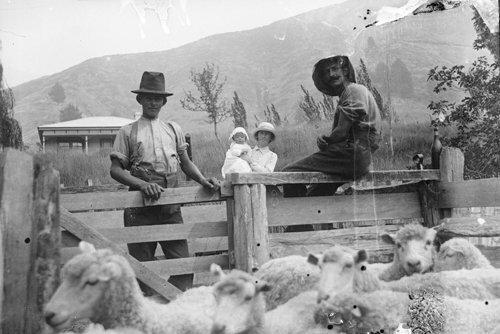 Lew's house built in 1916 was at, "The Chestnuts", the Couper family farm in Pelorus. It was built up on a Terrace, on the left hand side going toward Pelorus Bridge, opposite his sister Winnie's house. It was later lived in by his brother, Will [William Benjamin 1875-1971] and is still lived in by Ruth (nee Gardiner - daughter of Lesley who donated the negatives) and Paul O'Sullivan. Their daughter, Ruby O'Sullivan, is a six times great-granddaughter of the Daniel Couper who originally took up land in 1866.